Buddhism Illuminated: Manuscript Art from Southeast Asia is a lavishly-illustrated book published earlier this year by the British Library in collaboration with Washington University Press. The book aims to share many years of research on the British Library’s unique collection of Southeast Asian manuscripts on Buddhism, which illustrate not only the life and teachings of the historical Buddha, but also everyday Buddhist practice, life within the monastic order, festivals, cosmology, and ethical principles and values. The first two chapters, which introduce the outstanding art of Southeast Asian Buddhist manuscripts as well as the Life of the Buddha, were discussed in our previous blog. The third chapter of the book focuses on the teachings of the Buddha, or Dhamma, also known as the “righteous way”. Gotama Buddha spent more than half of his life walking around northern India over 2500 years ago, teaching his ever growing group of followers. Shortly after the Buddha’s parinibbana and physical death, the first Buddhist council was held at Rajagaha. Five hundred of the most senior Buddhist monks are said to have convened to recite and verify all the sermons they had heard during the Buddha’s forty-five years of teaching. They began to systematically arrange and compile the Buddha’s teachings called Tipitaka, or the 'Three Baskets', which include the Sutta Pitaka (the basket of discourses), the Vinaya Pitaka (the basket of discipline and monastic rules), and the Abhidhamma Pitaka (the basket of higher teachings of the Buddha). Five more councils were held over the centuries, with the most recent one taking place in Rangoon at Kaba Aye Pagoda from May 1954 to May 1956 to commemorate the 2,500th anniversary of the Buddha’s parinibbana. Buddhist texts that were compiled in addition to the Tipitaka are commentaries by important Buddhist scholars like for example Buddhaghosa, a fifth-century scholar who played a defining role in the development of Theravada Buddhism. Commentaries as well as translations were crucial for the spread of Buddhism to mainland Southeast Asia, where it is widely practised up till today. Chapter four of the book provides information about the Sangha, the Buddhist monastic community. Themes in this chapter include aspects of monastic ordination in Theravada Buddhism, how the Buddha founded the Sangha, and the rules of monastic discipline and interaction between the Sangha and the lay community. Soon after attaining enlightenment the Buddha founded the order of monks, or Bhikkhu-sangha, which was later extended to the order of nuns, or Bhikkhuni-sangha. After listening to Buddha’s first sermon, his five closest followers joined the Buddha and became his disciples, forming the first Sangha. Yasa, the son of a wealthy man, left his home as he was dissatisfied with his life. After hearing the teachings of the Buddha, Yasa became the sixth disciple to achieve the first stage of perfection. Yasa’s 54 friends followed his example. Later on, three brothers of the Kassapa family asked to be ordained into the Sangha after the Buddha tamed a naga (serpent). The book’s fifth chapter deals with Kamma, or the principle of cause and effect that tells us that every action produces an effect, and the effects of all our actions will return to us in the future. Our accumulated positive Kamma will come back to us in the form of blessings and the opportunity to lead a good future life or to experience a better rebirth, while negative Kamma will result in deterioration and lower forms of rebirth. Burmese and Thai artistic expressions of Kamma often include scenes of the Buddhist heavens and hells and the sixteen sacred lands of Buddhism. The illustrations portray the god Brahma with his four-faced head and a red aura (left) and the god Indra, or Sakka, also with a red aura (right). Both are seated on a marble pedestal before a red background decorated with delicate flower ornaments. Brahma and Indra are considered to have converted to Buddhism, therefore they are depicted in a respectful pose facing the Pali text passages from the Tipitaka that lie between them. The idyllic scene above shows the legendary region of Himavanta. Located in the animal realm of Tiracchana loka, it is covered in forests with great lakes and mountain ranges. It is inhabited by wild animals such as tigers, monkeys, deer, bears, birds, rabbits, cockerels and buffaloes who live together peacefully. Groves of mangoes, bananas and bamboo are featured in this illustration; all play a critical role as the animals’ survival depends almost entirely on these plants. The final chapter in the book provides details around “making merit” in every-day Buddhist life, which include activities that aim to support the Sangha, like the Kathina robe-offering ceremony, Uposatha or observance ceremony, and royal donations, but also rituals related to death and after-life, as well as communal festivals around the year which are open to everyone. This painting depicts the Uposatha ceremony, held on new and full moon days of every month. Lay people bring food and other offerings to the Buddhist monastery and observe five or eight precepts on these days. Three Buddhist monks, shown seated in a pavilion with their large fans, administer eight precepts to the lay community. These precepts are: not to kill, steal, engage in sexual activity, lie, become intoxicated, eat after noon, adorn their bodies or sleep on luxurious beds. Uposatha days provide time for people to listen to the teachings of the Dhamma and the chanting of special Suttas, as well as to practise meditation. During the Bun Phawet festival in January the Vessantara Jataka is recited by monks or performed in puppet or shadow puppet theatres in the monasteries, mainly in Laos and northeast Thailand. In preparation for Bun Phawet lay people create long paper or cotton scrolls and banners decorated with paintings of scenes from the Vessantara Jataka. These scrolls, often tens of metres in length, are hung on the indoor walls of monasteries while recitations of the Vessantara Jataka are being performed. The illustration shown here depicts a scene from the Vessantara Jataka which typically features on scrolls made for the festival: the final grand scene in which Prince Vessantara and his wife Maddi are reunited with their children who had been taken away by the Brahmin Jujaka. This happy occasion is celebrated with music (right). The book also contains a detailed bibliography, a glossary and three appendices providing a list of the 28 Buddhas of the past, explanations of symbols of the Buddha’s footprint, and an overview of the scriptures of the Tipitaka. The book is available from all major booksellers and online. For a significant part of the twentieth century Laos was embroiled in armed conflict. The country had been a French protectorate from 1893, following more than a century of Siamese suzerainty. During World War II it was briefly occupied by the Japanese. After World War II, Laos became involved in the regional fight for independence, known as the French Indochina War, which officially ended in 1954. Although Laos gained independence from France in 1953, political instability saw the country descend into civil war, in which foreign parties played significant roles as a result of the regional and world-wide struggles for power during the Cold War era. Despite its neutral status after the French Indochina War, Laos became entangled in the Second Indochina War, also known as the Vietnam War (1964 to 1975). The ongoing civil war in Laos, essentially between Royalist, Neutralist and the Communist (Pathet Lao) forces, became part of the greater conflict. By the late 1950s, a large area of eastern Laos was controlled by the Pathet Lao, along with North Vietnamese forces who had crossed the border to lend support. For almost nine years Laos was a battlefield in the armed conflict between neighbouring North Vietnam and the United States. During the war, US forces flew over 500,000 aerial bombing raids over Laos, which were said to aim at gaining control of the Trường Sơn Strategic Supply Route (also known as Ho Chi Minh trail). This logistical system was of crucial relevance in the Vietnam War since it was the only connection between the People’s Army of Vietnam (North Vietnamese Army) and the National Front for the Liberation of South Vietnam. More than two million tons of explosive ordnance was dropped on the country, even in areas which were hundreds of kilometres away from the Ho Chi Minh trail. Altogether, more tonnage fell on Laos than was used during the whole of World War II. 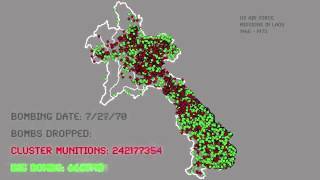 As a result of this war, Laos remains the most heavily bombed country in human history. Although the war in Laos officially ended in 1973, and subsequently the Lao People’s Democratic Republic was founded on 2 December 1975, the country is still affected by unexploded ordnance and the long-term effects of the use of chemical weapons. In contrast to Thai mural painting and sculpture, depictions of Gautama Buddha are relatively rare in Thai manuscript art. Numerous Buddhist temples in Thailand are famous for their lavish mural paintings illustrating the milestones in the life of Gautama Buddha, often beginning with his former existence as a Bodhisatta (Buddha-to-be) in Tusita heaven, or with the wedding of his parents, and ending with the distribution of his physical remains. Although the majority of Thai manuscript paintings are dedicated to Buddhist topics, instead of Gautama Buddha’s life these illustrations often highlight his former incarnations, particularly the last Ten Birth Tales, and the legend of the monk Phra Malai, or other subjects like the Buddhist cosmology, funeral ceremonies and meditation practices. However, there are some remarkable representations of Gautama Buddha in rare Thai manuscripts, and sometimes these can be found in a rather unexpected context. While the manuscript shown above was created for use by Buddhist monks on the occasion of the ordination of novices and new monks, the following book containing a collection of drawings and paintings on European paper may have been copied from one or more older manuscripts to serve as an artist’s manual. It includes numerous drawings from the Ramakien (the Thai version of the Ramayana) as well as a set of 23 ink-and-colour paintings illustrating the Ten Birth Tales and the Life of the Buddha. Another rare manuscript of a smaller, almost square folding book format was used by fortune-tellers in southern Thailand. Some men specialising in fortune-telling and divination were former monks and had acquired a good knowledge of the Buddhist doctrine. It comes as no surprise that the small book combines Buddhist topics, like Jatakas and cosmology, with folk legends and indigenous beliefs. Using the text and picture on a randomly chosen page, the fortune-teller would be able to interpret the fate of a person and give advice on how to avoid bad luck. Very often the advice would point towards making merit or following the Buddhist precepts for lay people. A book of Thai characters, which may have been produced on request of a Western traveller in 19th century Siam, contains ink coloured paintings of human figures representing various ethnic groups found in mainland Southeast Asia at the time, and of figures from Thai literature, particularly the Ramakien (Ramayana). Only on the first page there is a scene from the Life of the Buddha. Large illustrations covering one entire or more openings of a folding book like in the picture above are relatively rare. Most frequently we find a set of two smaller paintings touching the right and left edges of folding books with some text between them, as shown below. Happy New Year – with a splash of cool water! Between the 13th and 15th April the Water Festival, locally known as Songkran or New Year Festival, takes place in Thailand, and it is indeed one of the most colourful and merriest festivals in the entire region since it is observed in neighbouring Myanmar, Laos and Cambodia as well. Tai peoples living in the south of China and in Vietnam also celebrate the Water Festival. Songkran is derived from the Sanskrit word saṅkrānti meaning “progress” or “move forward”, describing the entry of the sun into any sign of the zodiac according to the solar calendar. The full traditional name of the April Songkran - when the sun leaves Pisces to enter Aries - was Maha-Songkran, meaning major Songkran, in order to distinguish it from the other monthly Songkran. Although Maha-Songkran takes place in the 5th month of the lunar year according to the traditional Tai calendar, it is regarded as the start of the New Year because it marks the beginning of the annual rice planting cycle, which usually starts in May as soon as the rains begin to fall. The origins of the festival are explained in a legend which is well known all over mainland Southeast Asia. There was once a young man, Dhammapala, who was highly prodigious in learning and could even understand the language of birds. The god Kabila Mahaphrom (Brahma) came down to earth to challenge Dhammapala with three riddles, with the wager that if the young man failed to give the right answers within seven days he would lose his head, but if he succeeded, Brahma himself would give up his head. Dhammapala had already prepared himself to die when, under a tree, he overheard an eagle mother telling her curious offspring the solution to the riddles. On the appointed day, the young man gave Brahma the three correct answers and the god immediately cut off his own head. However, Brahma’s head was extremely hot, and if it touched the earth, there would be a universal firestorm destroying all life, while if it fell into the sea, all water would dry up. Therefore, the god’s daughters took care of his head and deposited it in a heavenly cave. Once every year during Maha-Songkran one of the daughters removes the head from the cave, bathes it and carries it in a procession together with all the other gods and heavenly beings circumambulating Mount Meru. The procession is followed by a joyful feast of the gods and goddesses. The seven daughters represent the seven days of the week and all have their particular names and vehicles that they ride on, but the one who carries Brahma’s head on Songkran Day is called Nang Songkran, Miss Songkran. The heavenly procession and feast were traditionally re-enacted on earth, and this tradition is still followed today with some local amendments and additions. The exact date and time of the appearance of Miss Songkran with Brahma’s head is when the sun first enters the sign of Aries, a date and time to be established by astrologers and astronomers. The day before Songkran people clean their houses and compounds. Early on the first day of Songkran, people young and old visit their local Buddhist temples to offer food to the monks, to pray and to listen to sermons. Many communities organise temple fairs with music and other entertainments on this occasion. In the afternoon, there is an official bathing ceremony of the Buddha images and of the abbot of the local temple. After this purification ceremony begins the actual Water Festival, which traditionally involved people gently pouring water into the hands of elders and respected persons in order to pay tribute to them, and younger people helping the elderly take a scented bath and change into new clothes presented to them. During all three days of the Songkran Festival people amuse themselves by throwing water at each other or at strangers, and any passer-by can be sure to get soaking wet. Even monks are not exempted. In some places dry coloured powder is also thrown at people, an act that has parallels with the Holi Festival. Other activities during the Songkran Festival include a religious service in memory of the deceased and offering ceremonies for local guardian spirits. The ashes of the royal ancestors are blessed by the supreme members of the Sangha. In northeast Thailand, like in Laos, families organise Su Khwan ceremonies in order to wish each other good health, peace, prosperity and longevity, and to receive blessings from their elders. Many people engage in special merit making acts by releasing birds, fish or tortoises from captivity, or by offering sand to their local Buddhist temple. The sand offering, which can be made even by the poorest people and carries the same merit as a contribution to the building of a real pagoda, is done in form of erecting a sand pagoda or stupa-like structure in which a coin or a leaf from the Bodhi tree is placed. On the outside, the pagoda or stupa is sprinkled with water and can be decorated with flags and banners while candles, incense sticks and flowers are placed at its base. It is said that the sand helps to raise the level of the temple ground which may be susceptible to flooding during the rainy season. In many places, a beauty contest takes place during the Water Festival. The winner, who is not only the most beautiful and best dressed but also the most virtuous girl, is crowned Nang Songkran in memory of Brahma’s daughters who look after the god’s head eternally. She will take part in a colourful procession while being driven in a carriage that has the shape of the animal that is the vehicle of the daughter of Brahma whose turn it is to cleanse the god’s head at the beginning of this New Year. The British Library holds a small but significant collection of Lao material, consisting of manuscripts, rare printed books, periodicals and post cards, mainly acquired after 1973. However, the oldest items in Lao language date back to the 19th century. The earliest book about Laos is in Italian and was published in 1663. The collection of printed material in Lao language contains over 300 monographs, most of them dating from 1950 onwards. The highlights of the collection, however, are three of the first books printed in the Lao language: John Bunyan's Pilgrim's Progress in Tham (Dhamma) script, printed in 1896 by the Chiang Mai Presbyterian Mission Press (ORB.30/5145); the Évangile selon Saint Jean en laocien (Khampasœ̄t tām lư̄ang hǣng Yōhan) in Lāo buhān script, printed in Paris in 1906 (11103.b.19); and the Évangile de notre Seigneur Jésus-Christ selon Matthieu en laotien (Nangsư̄ khlittikhun pasœ̄t khǭng phra Yēsū Khlit tām thān Matthāi) in Lāo buhān script, printed in Song Khône, Laos, in 1916 (Siam.251). The latter appears to be the first book printed in Lao language in Laos. Book printing was introduced in Laos – at the time part of the Indochinese Union – through the efforts of missionaries with the Swiss Mission Evangélique in Song Khône, southern Laos. Together with a Buddhist monk Gabriel Contesse translated parts of the New Testament into Lao, of which the first part was printed in Lāo buhān script at a printing house in Paris in 1906. The second part was printed only after Contesse’s death in 1909 at the same printer. Finally, a press started printing material in Lāo buhān typeface at the mission in Song Khône thanks to the efforts of missionaries Fritz Audétat and Fritz Widmer. The heart of the Lao book collection is formed by publications of Maha Sila Viravong’s transliterations of literary, linguistic, Buddhist and historical texts from palm leaf manuscripts, for example rare first editions of Nangsư̄ thēt rư̄ang Vētsandon Sādok (Vessantara Jātaka, 1961, YP.2006.b.518), Phongsāwadān Lāo (Lao chronicles, 1957, YP.2005.a.6082), and Nithān Nāng Tantai (Lao version of the Panchatantra, 1957-66, 14304.b.23). Other rare printed works include original issues as well as microfilmed copies of historical Lao newspapers and journals, like for example Pituphūm (O.P.984, holdings 1969-71), Sīang pasāson (Or.Mic.7339, holdings 1975), Khāophāp pacham sapdā (ORB.40/986, holdings 1968), Sāt Lāo (Or.Mic.11526, holdings 1971-75), and Vannakhadisān (ORB.30/6967, holdings 1953-58). The Library also holds approximately 2000 books about Laos and Lao culture in Western languages, as well as in Thai and Vietnamese languages. These include some rare first editions, like for example de Gerini’s original description of Laos and other parts of mainland Southeast Asia Delle missioni dei' padri della Compagnia di Gesù nella Provincia del Giappone, e particolarmente di quella di Tumkino (printed in 1663 in Rome, V 5052), Vremde geschiedenissen in de koninckrijcken Cambodia en Louwen-Lant, in Oost-Indien zedert den Iare 1635 tot den Iare 1644 aldaer voor-gevallen. Mitsgaders de Reyse der Nederlanders van Cambodia de Louse Revier op, na Wincjan (printed in Haarlem in 1669, 566.f.20.(6. )), Henri Mouhot’s Travels in the central parts of Indo-China, Cambodia, and Laos, during the years 1858, 1859, and 1860 (published in London in 1864, 010056.f.8), and Siam and Laos as seen by our American Missionaries (published in Philadelphia in 1884, 4767.bb.8). Lao printed books and periodicals have now been fully catalogued and are searchable in the Library’s online catalogue. Map of mainland Southeast Asia, from Siam and Laos as seen by our American Missionaries (Philadelphia: Presbyterian Board of Publication, 1884). British Library, 4767.bb.8. In addition to printed material, the Library holds 85 manuscripts which are either in Lao language or in Pali, but written in Tham script or in Lāo buhān script. The collection comprises literary, historical and Buddhist texts, most of them written on palm leaves. A small number, however, are in form of folding books made from khoi paper or from lacquered cotton. Among the highlights are a rare Lao dictionary, which is a folding book in three volumes acquired in 1839 (Add.11624), Henri Mouhot's Alphabets and inscriptions (Or.4736), and a Kammavāca manuscript in Tham (Dhamma) script dated 1805 AD (Or.11797). Included in the manuscripts collection are also some wooden manuscript boxes decorated with lacquer and gold, as well as a few hand-woven manuscript wrappers made from silk or cotton. Other minor languages covered in the Lao manuscripts collection include some Tai Lue and Tai Khoen manuscripts. All items in the Library’s Lao manuscripts collection have been catalogued in the online catalogue, Search our Catalogue of Archives and Manuscripts, SoCAM. In addition to printed material and manuscripts, a collection of moving image and sound recordings from Laos is available in the Library’s Sound Archive. These include recordings of traditional Lao music, natural sound recordings, as well as a small number of documentaries and feature films. Among these are numerous unpublished recordings of remote populations of Laos, Cambodia and Thailand by Tom Vater. Access to the Sound Archive is through the online catalogue Cadensa. The British Library’s Endangered Archives Programme supports the preservation and digitisation of archival and manuscript collections in their country of origin. The Archive of Buddhist Photographs from Luang Prabang has been digitised in full through this Programme and is available here. In my two previous posts on this topic, I looked at palm leaf manuscripts from central Thailand and the northern Thai regions. In this final post on the beauty of palm leaf manuscripts in Tai manuscript cultures, I will take a closer look at traditional retrieval aids, and storage and preservation methods. Some temple libraries held large numbers of manuscripts which were stored in specially made furniture. Due to the fact that many manuscripts were wrapped in a piece of cloth, and the title or contents were rarely mentioned on the front leaf or front cover of a manuscript, quick retrieval of a particular manuscript was only possible if certain finding aids and methods were in place. For example, the manuscripts could be arranged in a systematic order within one cabinet, and several cabinets could be placed in a systematic order in the library building. One important finding aid was the title indicator. A title indicator, which could constitute a beautiful little work of art itself, was attached to a rope, and the rope was wound around the manuscript. Wooden title indicator covered with black lacquer, and text incised in Tham script on gold background. Lanna, 19th century. British Library, Or.16555. Acquired from Dr Henry Ginsburg’s bequest, in memory of Dr Henry Ginsburg. Title indicators made from wood or bamboo were important means of identifying manuscripts when these were stored together in large numbers in wooden cabinets. The length of a title indicator could range from 100 to 400 mm. Bamboo and wooden indicators were often simple strips with the title and list of contents of the manuscript incised or written on, but sometimes wooden and ivory indicators could be carved with beautiful floral ornaments. Often they were lacquered red or black and decorated with gold leaf before the text was incised. Two wooden title indicators covered with red lacquer, with text incised in Tham script on a gold background. Lanna, 19th century. British Library, Or.14528-9. Manuscript racks were used to hold manuscripts that had been selected to be worked with, for example to be read or discussed during Buddhist ceremonies and other events, or to be studied by an individual monk, or a monk with novices. These wooden stands can be decorated with intricate carvings, lacquer and/or gold leaf. A wooden manuscript rack with carved decorations found in Pakse, Champassak Province, Laos. On the rack are four wooden manuscript boxes. Photograph by Harald Hundius. Courtesy of Preservation of Lao Manuscripts Programme (PLMP), © National Library of Laos. Wooden manuscript cases that were custom-made for a particular palm leaf manuscript were often decorated in the same technique and design as the manuscript covers. These decorations included floral designs, animals or mythological figures, or lattice patterns. Gold leaf on black or red lacquer was one popular technique in the Northern Thai/Lanna, Lao and Shan traditions. Wooden case with Kammavācā palm leaf manuscript in Tham script inside. The decoration of the manuscript covers is repeated on the case. Lanna or Laos, 19th century. British Library, Or.16893. Photograph courtesy of Michael Backman. © Michael Backmann Ltd. However, most palm leaf manuscripts were not equipped with their own case but were stored in a larger casket, either a chest with a lid or a cabinet with lockable doors. Thick layers of lacquer helped to prevent damage to the chests and cabinets by the humid climate and insects. Long legs on the cabinets, and pedestals to stand the chests on, served to protect the manuscripts from flooding. Wooden manuscript chest from Lanna or Shan State decorated with red lacquer, raised gilt lacquer as well as carved and gilt wooden applications, 19th century. British Library, F1060. Bequest from Doris Duke’s Southeast Asian Art Collection. Whereas in southern Laos the lai rot nam technique enjoyed great popularity, in northern Laos and Lanna the gold-on-lacquer stencil painting technique was more widespread. This technique, which was also used by the Shan, Tai Khoen and and Tai Lue, involved creating designs on paper which were cut into stencils afterwards. The paper stencil was then placed over a pre-lacquered surface and gold leaf was applied. The gold leaf easily adhered to the pre-lacquered surface (Warren 2004, p. 109). However, both techniques could be combined. Large chests and cabinets were produced for the storage of manuscripts in Buddhist temple libraries (hǭ tai) or in royal and local palaces. The largest cabinets could be over 2 metres high and were designed to house an extensive collection of manuscripts belonging to the Tipitaka. Accordingly they were called tū traipitok. They were often lavishly decorated with scenes from the Jātakas, mythological animals in the Himavanta heaven, and floral designs (Kō̜ngkǣo 1980-88). Regular communal ceremonies called bun bai lān were - and still are - organised to preserve the palm leaf manuscripts that are stored at Buddhist libraries, which are valuable treasures of the local communities (see DLLM). At such ceremonies, which can take place annually or once every several years, the palm leaf manuscripts are removed from the storage furniture, cleaned from dust, dead insects and dry mould by wiping them with a clean, soft piece of cotton or a brush made from soft animal hair on a bamboo stick. The furniture is cleaned as well on this occasion. The cleaning tasks are carried out by lay volunteers and novice monks. Procession on occasion of a Bun bai lān ceremony. Atsaphon District, Savannakhet Province, Laos, 2002. Courtesy of Preservation of Lao Manuscripts Programme (PLMP), © National Library of Laos. Damaged manuscripts can be repaired or copied onto new palm leaves by trained monks and novices, and broken covers, title indicators or torn wrappers can be replaced with new ones. At the end of this work which may be carried out over several days, monks would usually bless the manuscripts and thank the members of the community in a ceremony. Afterwards, the members of the community, novices and monks help to carry the manuscripts back to the temple library in a colourful procession. A traditional wooden manuscript repository (hǭ tai). Vat Canthasalo in Ban Nong Lam Can, Camphon District, Savannakhet Province, 1994. Courtesy of Preservation of Lao Manuscripts Programme (PLMP), © National Library of Laos. Traditional manuscript repositories (hǭ tai) could be found in Buddhist temples, where special buildings were erected on high base walls, stilts or pillars in order to keep the manuscripts safe from leaf-eating animals and floods.